“From the antiquity to today, there has been poetry that literally performs computations, processing its own letters. Prototyped by magic and Pythagorean mathematical aesthetics, it encompasses such diverse forms as kabbalist and Lullist language combinatorics, word permutation poetry, ludistic poetry, computational text collage, aleatoric, stochastic and recursive texts, Oulipian constraints, computer-generative literature, poetry in programming languages, and codeworks. Just like visual and sound poetry poetize the graphetic and phonetic dimensions of words, these writings show that computation is a dimension of language. On top of that, their poetics is rife with speculative and contradictory programs: often one and the same text form is at once being instrumentalized for total art and anti-art, mysticism and technicism, order and chaos. This has resulted in a fantastic literature whose speculative imagination manifests itself in the arrangement of letters rather than the semantics of the text. 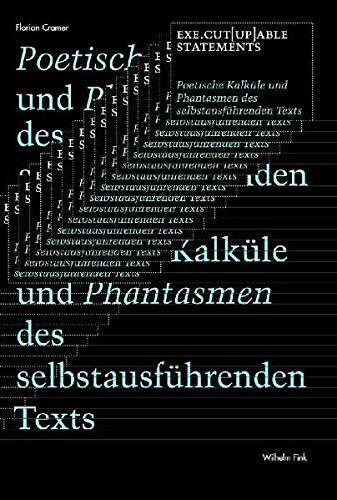 The book includes close readings of a 17th century sonnet (Quirinus Kuhlmann’s “XLI. Libes-kuss”), a 20th century musical composition (Alvin Lucier’s “I am sitting in a room”) and a 21st century net.art codework (mez breeze’s “_Viro.Logic Condition][ing][ 1.1_”), and discusses limitations of existing literary and media theory for criticism of these works. Note: the book has just become free for Open Access publishing and is offered here for download in its manuscript version, licensed under Creative Commons Attribution Unported 3.0.